The Official 2013 Cherry Blossom Festival Print features a massive blooming Yoshino cherry tree upon the shore of the Tidal Basin with the Jefferson Memorial (painted to scale) in the background. Overflowing with bright, bold colors this print will stand out in any setting whether it is hung in an office, hallway, or living room. This is a very rare and beautiful Washington DC souvenir print that is no longer in circulation. 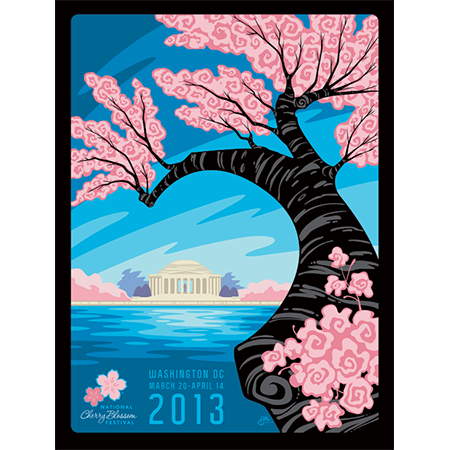 The 2013 Cherry Blossom Festival poster has been created by the artist Erik Abel whom is widely recognized for his bold colors, distinct waves, organic textures, and unique juxtapositions of geometric patterns which have captivated the attention of collectors, galleries, and institutions worldwide. His technique and nature-based subject communicate a sense of balance, experimentation and wonder. Best Official National Cherry Blossom Festival print to date.